This post is a bit more sharing my findings rather than discussing technique, like the previous posts, but important nonetheless. An often overlooked component in the chain of making good coffee, a clean and well functioning group head is important in both shot extraction and overall quality and taste. After all, if you're going to use good quality water, quality coffee, a proper grinder, a good machine, great accessories, and proper technique, you don't want a dirty or poorly distributing shower screen tainting your results! 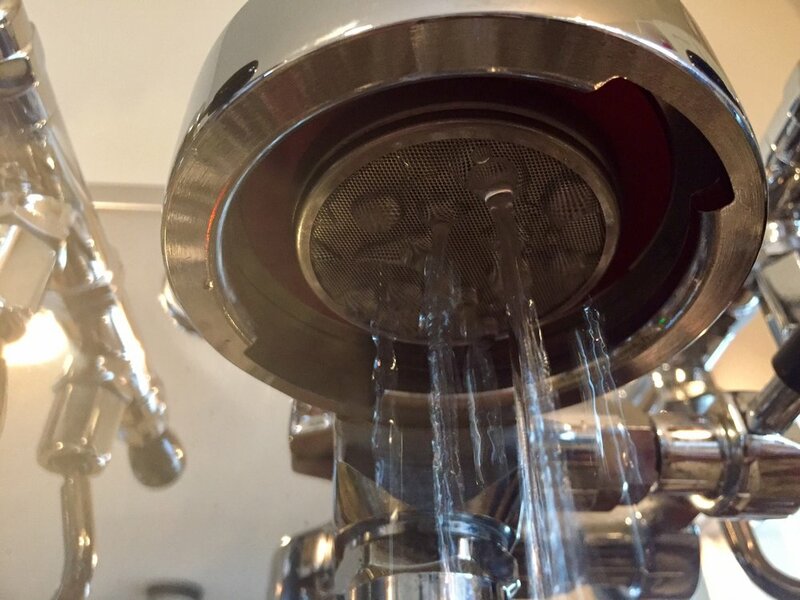 The shower screen or dispersion screen is responsible for evenly dispersing or showering water on the coffee puck. Keep in mind that during an espresso extraction, the coffee expands within the space of the portafilter basket and the shower screen to create the approximately 9 bars of pressure needed to make espresso. Coffee grounds and brew water also come into contact with the screen when an extraction is ended on machines with a three way solenoid valve. The act of forcing the remaining water out of the brew path and through the exhaust into the drip tray actually passes some coffee grounds through the screen and into this exhaust path. Being that part of this path is shared with the incoming brew water, and keeping things clean is important for longevity, you certainly don't want any of those grounds and oils hanging around these areas. This is why backflushing and grouphead cleaning are important, but it's also why the shower screen needs to be replaced periodically. Even with good, routine cleaning and maintenance practices, oils and particles can build up within the layers of the screen which can then affect the taste and quality of the coffee by imparting those unwanted flavors or creating an uneven extraction with any blockages. Observing the flow of water when rinsing the screen, holding the screen to the light when it's removed for cleaning, and tasting the water passing through the brew path (without brewing coffee) are all ways to monitor the performance of your screen. When it came time to replace my shower screen, I decided to give one of the aftermarket "high performance" type screens a try. There are many available these days aimed at improving the flow and distribution of water as well as how well they stay clean. At just $4, including free shipping on parts, I decided giving the Espresso Parts HQ (high quality) E61 screen a try was pretty low risk. The polished stainless steel walls are said to promote a steadier rate of water flow, and Espresso Parts' HQ line in general offers thoughtful performance and reasonable prices. Interestingly, the HQ screen actually has fewer but larger holes than the stock, and has a larger center void than the stock ECM screen as well. The (dirty) stock screen on the left and the Espresso Parts HQ dispersion screen on the right. Click through for more info on the EPNW HQ Screen. The difference in flow was not dramatically different than the stock, as you might expect by appearances alone, but it did seam to be steadier, more consistent, and more equally dispersed, as I've tried to capture in these photos. Where I've seen the biggest difference though is in how well it stays clean, and that my pucks knock out of basket easier and cleaner. The screen seems to stay a little cleaner, just based on appearances and the amount of grounds left in the blind basket when backflushing. But it's the ease at which pucks knock out and that they almost always knock out completely intact now that's most surprising. Not changing anything resulted in a more thorough and intact ejection of grounds when knocking out the portafilter, leaving behind a cleaner basket. I'm not entirely sure why this is, but it could be that the old screen was blocked or not allowing as much water to exit when terminating the shot, leaving behind a wetter basket, or that the screen (or gasket) is creating a better seal, keeping the coffee bed more intact, leading to more complete knock out. I wasn't expecting this result, so I don't have a before pic, but it is making cleanup easier. The other variable in play with this change is a new group gasket, which I didn't suspect to make any performance impacts. The stock rubber gaskets can wear out overtime with remove and reinstall for cleaning as the rubber dries out and begins to crack. I had been using the stock gasket for nearly three years with regular cleaning, and it only just recently started to show signs of deteriorating. I chose to replace the stock rubber gasket with a silicone option from Cafelat due to the promise of it potentially lasting forever since it won't dry out like rubber does. Even if the Cafelat gasket only lasts as long as the basic rubber one, I do appreciate the softer feel when locking in the portafilter, and it almost feels more versatile or better molding when using different baskets and/or different portafilters which can sit and seal with some variance. This improved seal could also be a factor in why I am experiencing cleaner puck knock out with the new screen, if the better seal is allowing the coffee bed to better stay intact during and after extraction. Unfortunately, the rubber gasket was beginning to no longer seal as cracks started to form when fitting the new screen, so I'm unable to test that comparatively. Regardless, the Cafelat group gaskets feel great, don't have any rubber coming into contact with anything, just food grade safe silicone, and have promise of lasting even longer than the only slightly less expensive rubber gaskets, so it again seems like a no brainer to me. Overall, I do feel like my extractions have been more even or consistent, though I don't know if that can fairly be attributed to the screen and/or the gasket, with the variables in the coffees I've been using, but I'm happy with the changes and consider them an improvement either way. I do hope this post helps highlight the importance of these often overlooked components, and how they place a crucial role in the overall quality of your espresso, while being relatively easy and inexpensive to maintain. The Cafelat Silicone Group Gasket, in general, is a no brainer when time comes to replace a standard rubber gasket. Thank you for reading, if you have any questions, comments, or thoughts, please feel free to comment below or reach out via the contact me page. If you're interested in purchasing a Cafelat Group Gasket, doing so via the links throughout the article and below helps support this site, and is always appreciated.